The cry of the children. 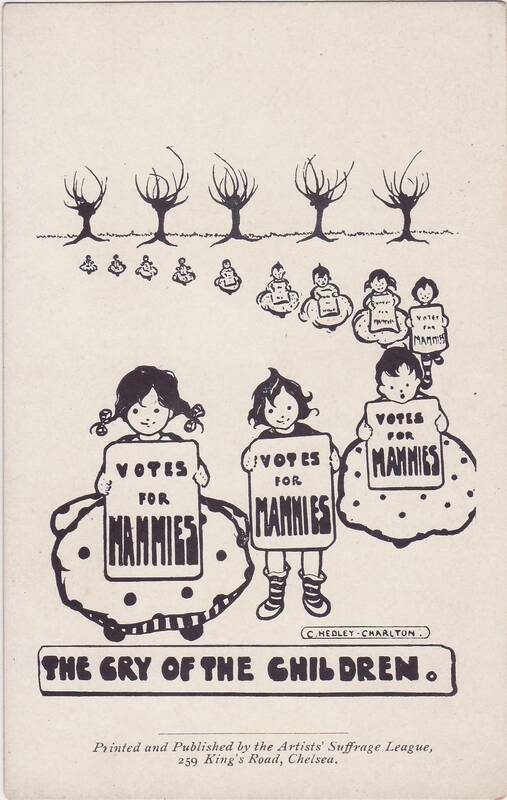 This postcard, The cry of the children’ shows a line of boys and girls carrying placards with the message ‘Vote for mammies’. The Museum of London write that in choosing this subject, it was a deliberate effort to counter the anti-suffrage view of suffragettes as women who have turned their back on the domestic duties of wives and mothers. 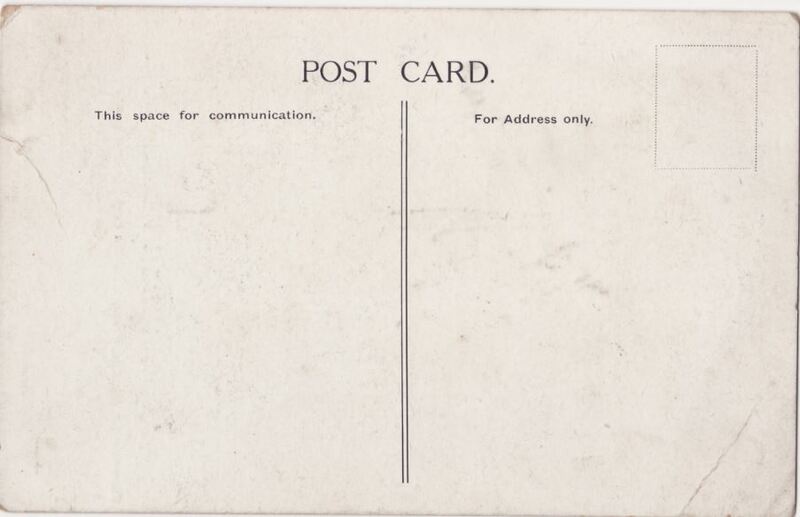 The postcard was designed by C. Hedley Charlton and published by the Artists’ Suffrage League. 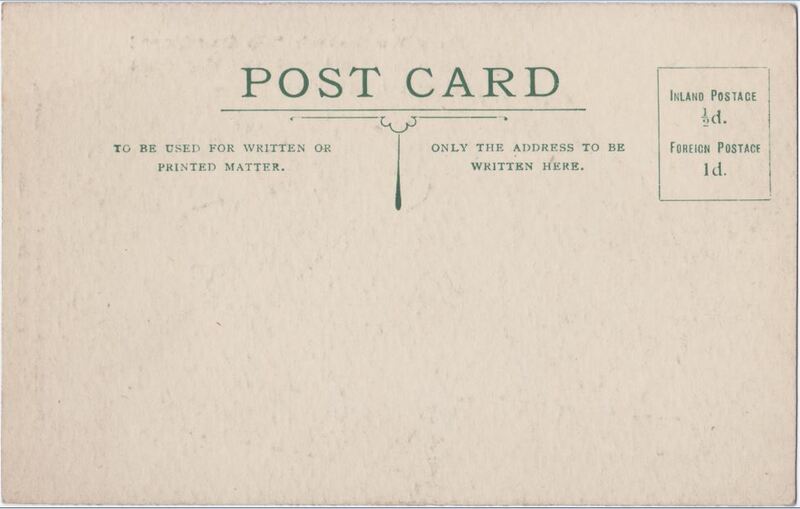 There are online versions of this card at the Museum of London and a coloured poster version at the Women’s Library. It is also featured in Kenneth Florey’s book Women’s Suffrage Memorabilia. The title of the postcard may refer back to a poem by Elizabeth Barrett Browning, entitled ‘The Cry of the Children‘ published in 1843. Her poem is about child labour and exploitation. Lady Canvasser. Have you a vote, Mr. Brown? long as my wife takes in washing. 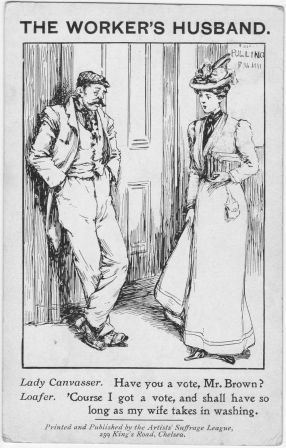 This card focuses on a dialogue that takes place at a polling station between a ‘loafer’, Mr Brown, and a ‘lady canvasser’. One has the right to vote and the other does not. The man (the ‘loafer’, i.e., an lazy person who avoids work) is more roughly dressed, and seen as slouching against a door with his hands in his pockets; he also uses less refined grammar in his speech. The Reform Act of 1884 extended the number of men who were eligible to vote to ‘all adult householders and men who rented unfurnished lodgings to the value of £10 a year’ (History Learning Site). The loafer then, despite not being employed, was presumably able to maintain lodgings to this value due to his wife’s work. This is in stark contrast to the smart canvasser and the working wife, neither of whom had the right to vote. This postcard was published by the Artists’ Suffrage League. It has no initials or name of an artist. A copy is available online at the Women’s Library and in the collection of a suffragette, Alice Hawkins. I shall be in until Thursday.. Can you come over for the day after Tuesday or Wednesday. Let me have a PC. I hope by now your face is better. Have you heard what date the meeting will be. Let me know directly you hear as I have several over here that will come. Daddy’s collars have come back. 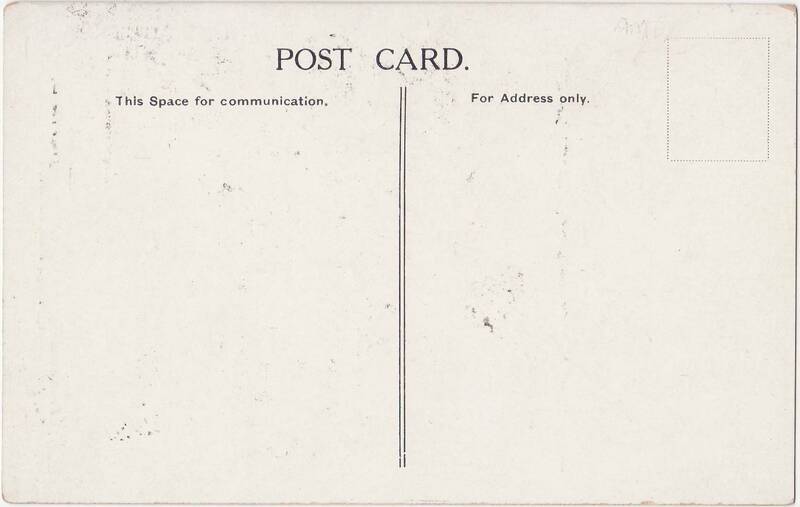 With love H.
This postcard, by the Artists’ Suffrage League, was addressed to the rights of women in society and the inequality between the rights of a mother and those of a father, rather than the more specific right to vote. It shows a mother holding her baby standing at the door of the local government board talking to a registrar who oversaw vaccinations. 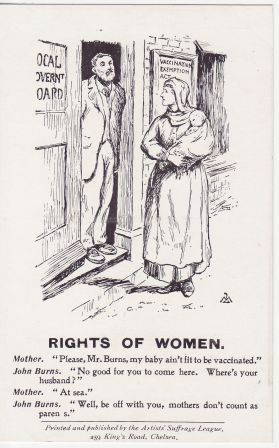 She is asking about an exemption for her child – the notice behind her draws attention to the ‘Vaccination Exemption Act’ (1907). The mother asks for an exemption but is dismissed as only the father could obtain this exemption (except for certain circumstances). According to the Centre for the History of Medicine at University of Glasgow, following a series of Vaccination Acts in England, vaccinations were made available to the poor and over a period from the 1850s to 1860s the vaccination of children in England became compulsory. Due to religious beliefs and fears about possible side effects, some people objected and in 1907 the law was amended to allow for ‘conscientious objection’. In order to gain permission a father had to appear before a magistrate, explain his objection and then pay a fee to receive a certificate that could be presented to the registrars. Despite some Parliamentarians arguing that mothers should also be able to obtain this exemption this was not permitted. The only exceptions according to the website were ‘unmarried mothers or widows, or women whose husbands were abroad for a long period‘. 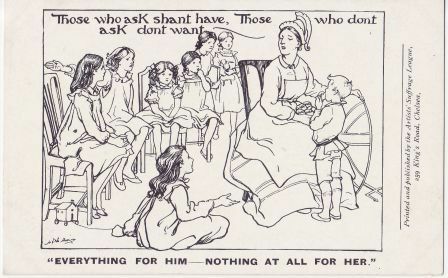 The card was published by the Artists’ Suffrage League, no artist is named. A copy is available online at the Women’s Library and the Museum of London. This postcard features a mother feeding cookies to her son– each bearing the word ‘Vote’. The mother is Britannia, as indicated by the trident and shield but in this case she is wearing an apron over her usual robes. The scene is watched by seven girls who are told ‘Those who ask shan’t have, those who don’t ask don’t want’. The girls display a range of emotions, some seem confused, others quiet and two seem to be arguing or trying to reason with the mother. Across the bottom of the card it states ‘Everything for him – a nothing at all for her’. According to Schlossberg (2003), this postcard deals, in the form of Britannia, with the topic of female anti-suffragists. It also continues the theme of a postcard, Franchise Cake, featured in an earlier blog of the fight for votes being equated to a fight for food. The postcard is signed but I have been unable to decipher the name nor to find a reference to the artist who created it. It is published by the Artist’s Suffrage League. 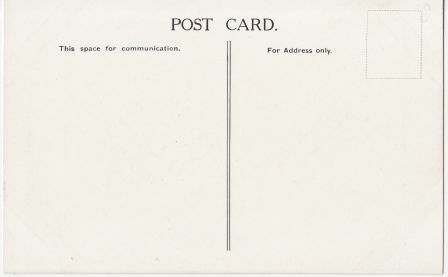 The card includes a dialogue between Jane Bull and Johnnie Bull in which Jane asks to share some of the ‘franchise cake’ that Johnnie is eating. When Johnnie responds that it wouldn’t be good for her, Jane points out that it hasn’t hurt the girls; children from Finland, New Zealand, Australia and Norway sit in pairs sharing food. In all of these countries women had equal voting rights (in 1905, 1893, 1902, 1907 respectively). The description of this card at Museum of London points out that Jane ‘towers over’ Johnnie, indicative of the growing suffrage movement. They also note that the message is a direct challenge to anti-suffrage supporters who believed that the social order would be disrupted if women were allowed to vote by pointing out that this has not been the case in the named countries. The ‘Franchise cake’ postcard is also discussed in McDonald (1989) and in McQuiston (1997) and is online at the Women’s Library. 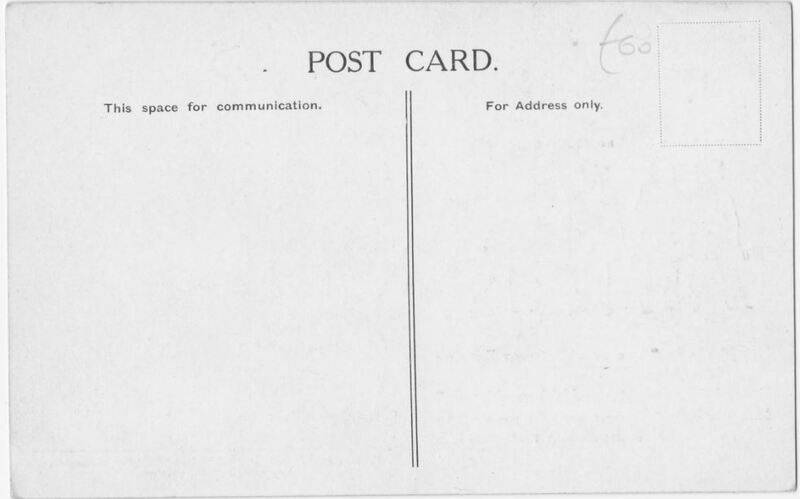 In a chapter entitled ‘Consuming images: women, hunger, and the vote’ Linda Schlossberg discusses this postcard and another (Everything for Him – Nothing at all for Her also published by the Artists’ Suffrage League) and argues that WSPU propaganda often represented the fight for suffrage as ‘a struggle […] over the distribution of food’ and the ’sexual politics of hunger’ (p.95). These cards were all printed and published by the Artists’ Suffrage League, and has two sets of initials—CH & JM—representing C Hedley Charlton and unknown. Ian McDonald (1989) Vindication: A postcard history of the woman’s movement. Deirdre McDonald Books. Liz McQuiston (1997) Suffragettes to She-Devils: Women’s liberation and beyond. London: Phaidon. Linda Schlossberg (2003) ‘Consuming images: women, hunger, and the vote’ in Tamar Heller & Patricia Moran, Editors, Scenes of the Apple: Food and the Female Body in Nineteenth- and Twentieth Century Women’s Writing, pp. 87-107. 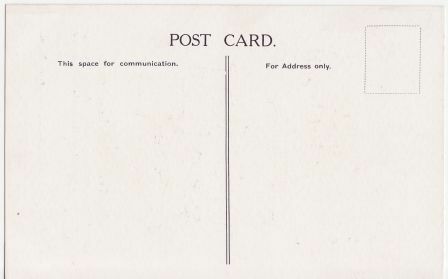 This postcard utilised the popularity of bicycles to contrast the voting rights in Britain with the more progressive approach in a British colony. New Zealand had in fact given women equal voting rights in 1893, the first country to do so. The reference to youth was because NZ had been declared a dominion within the British Empire in 1907 (BBC New Zealand profile, 2014). 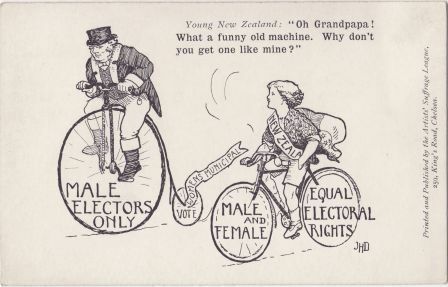 In the image, John Bull’s bicycle has the text ‘Male electors only’ on the large front wheel and ‘Women’s municipal vote’ on the much smaller rear wheel indicating the small progress made in women’s voting rights; the NZ bicycle wheel has ‘Male and female. Equal electoral rights’ on its two equally-sized wheels. The old fashioned penny farthing or high wheel bicycle ridden by John Bull was contrasted with the more modern bicycle ridden by a youthful New Zealander. On his blog post about the rise in popularity of cycling, Martin Plummer also points out that the young NZ woman is depicted riding with one hand in her pocket, suggesting considerable mastery of her bicycle. 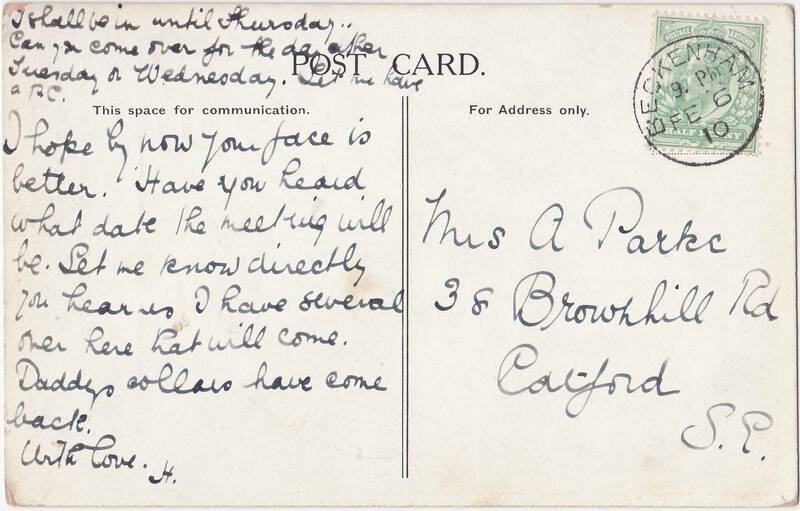 This postcard is featured on another interesting site by a historian of women’s cycling, Sheila Hanlon, who writes about the connection between cycling and women’s suffrage in the UK. 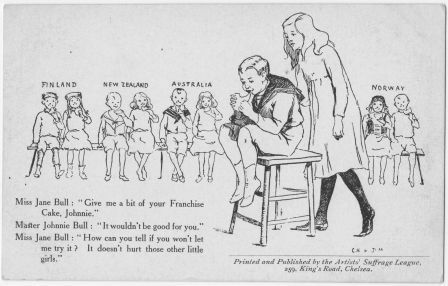 The ‘Young New Zealand’ postcard was designed by Joan Harvey Drew (JHD) and published by the Artists’ Suffrage League. There is a copy of the postcard at the Museum of London as well as on the cycling sites already listed by Sheila Hanlon and Martin Plummer. I will now indicate to you. The harmless woman never may. This postcard was designed by C. Hedley Charlton and published by the Artists’ Suffrage League. 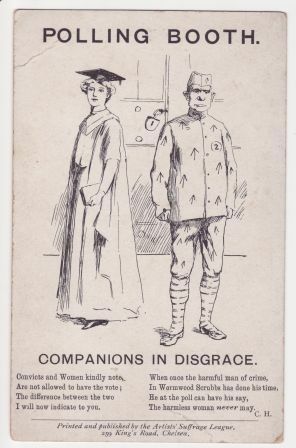 The image and poem beneath refers to a convict who commits a crime but is then allowed to vote on release from prison, which contrasts with the ‘harmless’ woman who cannot vote. It was a popular theme; another example can be seen in Tickner, Colour Plate IV. As in that design, Convicts and Lunatics, by Emily Harding Andrews, the woman is educated as indicated by the university cap and gown; the criminal wears prison garb. In a popular theory of the time, the woman’s features are refined and suggest superiority over the cruder features of the prisoner who would be viewed as ‘degenerate’.